1. 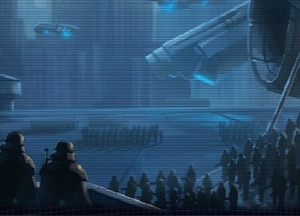 The SWTOR info snippet released by Bioware this week is on the potential infiltration of the Sith into the Jedi order. There’s a nice wrap up from Darth Hater on the info, including some snippets from SWTOR developers. 2. GamesRadar got their hands on part of SWTOR, and have a very detailed look here. They make some interesting point on the fact that no matter how interesting SWTOR ends up, at the end of the day it will be bound by a bunch of bog standard MMO mechanics. For me, that’s not necessarily a bad thing! 3. From our forums: discussions on choosing factions, the appeal of the Republic side and the link between KOTOR II and SWTOR. 4. From the official forums: The SWTOR wish list thread, whether people just want World of Warcraft in SWTOR clothing and an index of useful guild threads.